Stanley Auto Group aims to maximize value for our customers, communities, employees, and corporation by working hard to be the first auto dealer choice for Texans near and far. Our dream is to fulfill the automotive needs for generations of families and be a positive staple in our communities. 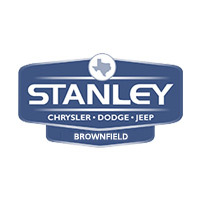 Come visit Stanley Chrysler Dodge Jeep Ram Brownfield and experience the difference! We treat all of our customers like family whether you have purchased from Stanley or not. Regardless of your credit situation, we can help drivers of all credit histories find competitive auto financing. Also, Stanley Chrysler Dodge Jeep Ram Brownfield has a service center with trained technicians to work on all types of vehicles. At Stanley Chrysler Dodge Jeep Ram Brownfield, we offer a friendly and transparent car buying experience. Please contact us if you have any questions, and we invite you to visit us at 1706 Lubbock Rd here in Brownfield.